One of the tasks of early American science was to discover and catalog the flora and fauna of this uncharted land. 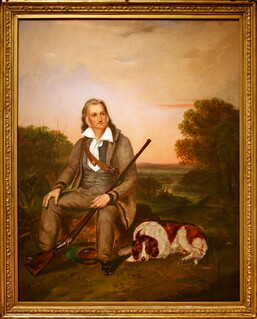 Working diligently to make the natural world wholly known, artist-naturalists such as George Ord, Alexander Wilson, and the Peale family created faithful renditions of America's birds and animals. The flamboyant John James Audubon, son of a Frenchman and his Creole mistress, revolutionized this dry academic field by creating images of birds with all the color and bravura style of the Romantic period. Audubon frequently got the science wrong-he feuded continually with the earlier generation of ornithologists-but the aesthetic achievement of his Birds of America (1827) cannot be denied. Audubon was a major contributor to the Romantic interpretation of the American landscape by both writers and artists, which took place after about 1820.